BA (Baluchistan askari mall) has many different investment opportunities. Ba mall consists of shopping mall, super store, hotel, banquet hall, restaurant, food court, clinics, offices, cinema hall, children play area, place for prayers (Masjid), open and covered car parking. The mall will be 3 floors with car parking in the basement. Shops are the main attraction of the mall. Shops are of various sizes. Small and large shops are available which are the choice of the world famous brands and are high in demand. Shops are on easy installments with easy down payments method. Shops can also be purchased on cash payment. BA mall is currently the top of the list standard property investment opportunity in Quetta. After the success of the Quetta millennium mall, Gold city mall, Mds store and now Jan mall. People are have more confidence in such luxurious properties in Quetta which was not that common ten years ago. The project builders are new green land services who are working at full potential to make a major change in the shopping landscape of Quetta city. The construction work can be seen from the main airport road. A temporary boundary wall is set around the work site. Heavy machinery can be seen digging. 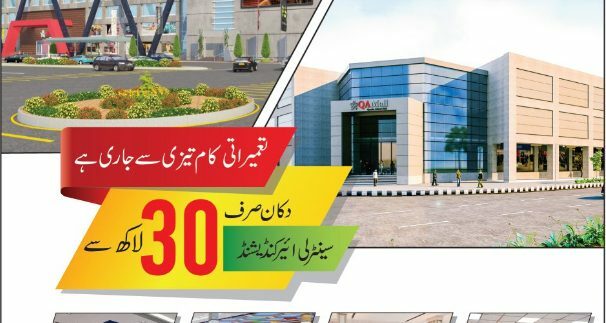 BA mall will be providing all the basic facilities of international standards. Ba mall will be giving high standard earth quick proof construction, firefighting systems, spacious car parking, speedy lifts, modern escalators, full time security, elegant design, centrally air-conditioned, huge lobby and spacious overall design. Actually these are two buildings with the the name of Baluchistan Askari mall and Quetta Askari mall. 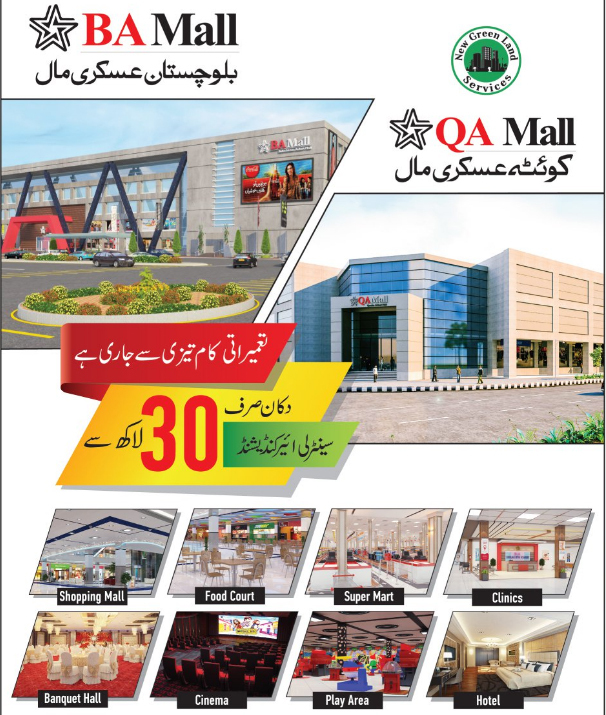 QA mall or Quetta askari mall is right in front of Chaman housing and between Askari park. It is situated on the triangle shape plot which is also called Golden triangle plot. Quetta askari mall has three entrances. Quetta askari mall has an underground parking in the basement. On the ground floor there is banquet or marriage hall and shops. It is centrally air conditioned with state of the art security system. on the second floor there are food courts and shops. there is also space available for lawyers chambers. Quetta askari Mall has front on three main roads around it. 25 percent advance payment. 75 percent will be paid in 20 months installments. Note: This article is written by makanpoint staff. for further information please contact Ba mall site office.